One of the best perks to managing farmers markets - we get to visit farms! Today it was Two Gander Farm at their new home in Downingtown, PA. Folks, this is Chester County at its best! The road to Two Gander. At the center of the farm is a beautiful house built in 1828. The house is under the Brandywine Trust, and Trey and Deirdre Flemming of Two Gander Farm intend to bring it back to its farming roots. 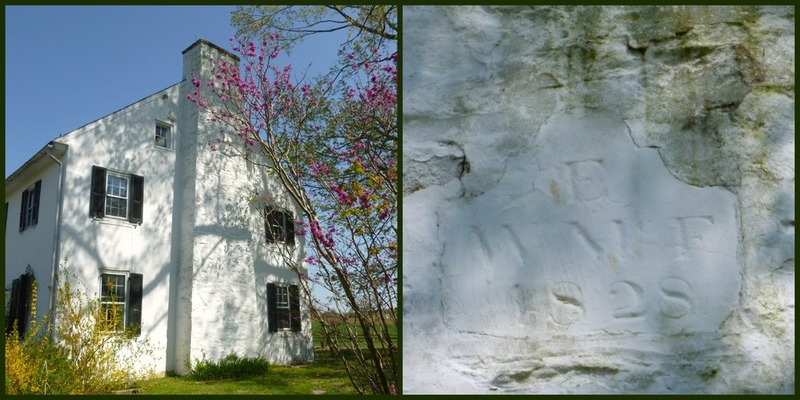 The plaque at the top of the chimney reads 1828. The barn is spectacular, inside and out - and its currently housing a tenant - a resident owl "who" was annoyed by our visit. The timber framing is breathtaking. There are a number of outbuildings of interest - the spring house, the corn cribs, and stately silos. And every old farm house needed an outhouse - this was a regal structure in its time. Looks like the only residents at the outhouse are the critters, with a special open door policy. There were also birdhouses everywhere - built special for bluebirds and swallows. The fields had been freshly plowed - ready to receive the seeds for the season. As I snapped this picture there was a bald eagle soaring overhead - what a majestic site it was. The real action these days is in the green house. It was filled with flats of tender new seedlings awaiting the warm weather for their new home outside in the fields. 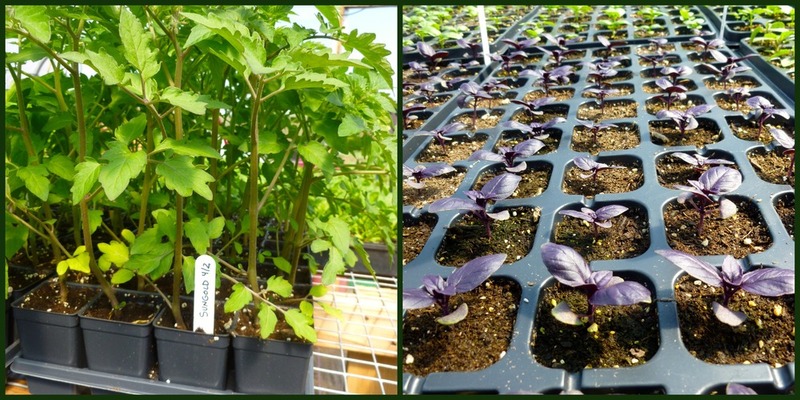 Gorgeous tomato plants were thriving next to purple basil, destined for a summer salad. Swiss chard and lettuce were leafing out nicely. Patty pan squash, peppers, peas and parsley! And then there's honey - Pooh would love Two Gander as they collect the tastiest honey around. There was a lot of activity around the hives on this warm sunny day, and some of that buzzing was getting a little too close for comfort, if you know what I mean. We'll be watching the fields of Two Gander closely over the growing season - do you know where your food comes from? You'll learn by following the blog! Two Gander will be bringing their farm fresh produce and sun sweet honey to both the Malvern and Downingtown Farmers Markets.